100% Safe Materials: SGS certified. Plated in GENUINE SILVER PLATINUM with the Look of Fine Jewelry. 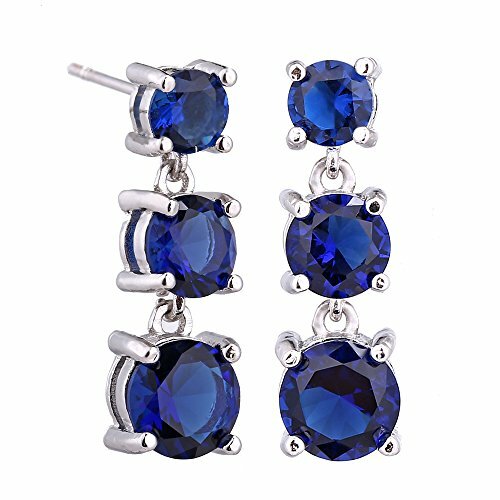 5D shiny attractive navy blue sapphire cubic zirconia crystal rhinestones with copper and sterling silver needles. Lead free and nickel free. Hypoallergenic. Perfect Size: Gemstones: 5mm 6mm 7mm. Total Length: 0.90 inches (2.28 cm). Weight Per Earring: 0.09 ounces (2.2 g). Tiffany Blue Gift Pack: Wrapped in fashion gift box. Two pair of earring backs are included for free. Perfect gift idea. Suitable for Many Occasions: Wedding, Mothers Day, Valentines Day, Anniversary, Graduation, Birthday, Party, Ball, Prom, Christmas, Best friends, Girl friend, Wife, Sisters etc. If you have any questions about this product by AMYJANE, contact us by completing and submitting the form below. If you are looking for a specif part number, please include it with your message.